World Cup news coverage in America is almost non-existent. There’s a virtual Black Out. The most popular sporting event in the world is being largely ignored by the mainstream news media right now in the United States. Why is that? Some believe it’s because all the news so far is good . The planning was impeccable. Well -funded. The stadia up-to date with good facilities. The hosts welcoming and friendly. And no appearances of “Russian nationalist xenophobic hooligans” attacking foreign fans because of genetically caused racism. What’s not to love, America? Why is it non -existent? Because they are waiting for the BAD news. Trust me. If there is one instance of a few Russian fans fighting with supporters of another team the usual suspects will be all over it. 24/7. To expose the true nature of “Putin’s Russia” (the apostrophe indicates ownership here) the well-respected American networks will provide “expert” perspective by individuals who are either paid to write anti-Russian propaganda or who are motivated by a deep-seated hatred of Russia and Russians – a phenomenon we would normally call racism. But these are not normal times are they? The American news media has been – let’s be honest- less than fair in its coverage of Russia and Putin, who will probably go down in history as one the greatest leaders of all time. In fact, they have on several occasions portrayed him as Hitler. Talk about a slap in the face. Would they ever refer to an Israeli leader that way? Did the Russians suffer any less than the Jews from Nazism? You do the math. If the American news establishment ever deviated from their negative coverage of Russia and provided positive coverage of the World Cup it would confuse the audience and undermine their efforts to malign and denigrate the new enemy. For that is how Russia is perceived – reality be damned. The truth, of course, is getting out about the success of the current World Cup. Through “foreign media” from around the world. And the Internet. It’s pretty much all positive. This is a huge PR win for Russia. And Putin. The man simply knows what he’s doing. In that sense he really is the enemy of America. That is why they fear him so much. My guess is that the owners of the American news media have the most to fear if Putin becomes more popular and respected on the world stage. Why else would they be so apoplectic and over the top in their negative coverage of Russia and ignore the World Cup? 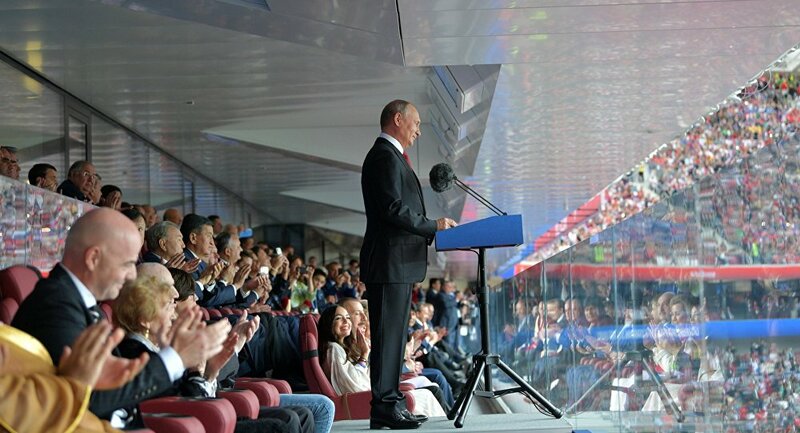 The problem is… America is not the world and when “foreigners” (the rest of the world ) see or read that America has ignored the Russian – hosted World Cup American credibility and respect will be damaged. It will be seen for what it is. People know the game. Talk about an own goal.